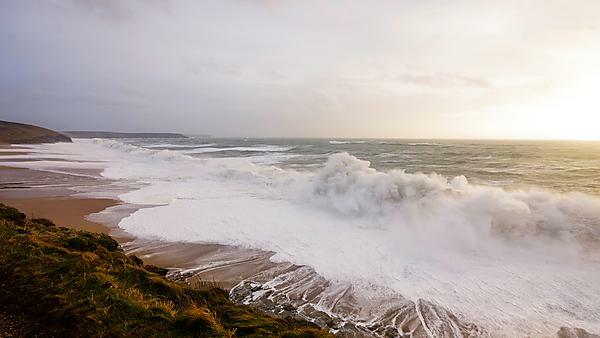 The winter storms of 2013/2014 have highlighted the vulnerability of coastal infrastructure in the United Kingdom to attack from extreme wave events. Sea level rise due to the effects of climate change may further increase the inundation hazard for many coastal communities, while intensification of coastal development makes the protection of such communities a priority in future years. Current design practice tends to utilise average quantities, rather than considering the effect of a single extreme wave on sea defence structures. The ENFORCE project aims to investigate the coastal response to an extreme wave event, where the extreme event is modelled as a focused wave. The coastal response may be the extent of wave runup on an idealised beach, the volume of water overtopping a coastal structure or the force exerted on the structure by a wave impact. Previous experience has shown that a focused wave is able to reproduce the properties of an extreme event within a random process, without the need for lengthy experiments or numerical simulations. The NewWave profile has been successfully validated as a design wave in offshore engineering application, and this approach will be applied to extreme waves approaching the coast. Numerical modelling work within the ENFORCE project will be undertaken at the University of Oxford, where the OXBOU numerical model will be extended to include active wave absorption. This will allow the results of random wave simulations to be compared to the focused wave simulations, validating the use of the NewWave profile for this study. The predictions of the OXBOU numerical model will be compared to measurements from the 35 m wave flume in the COAST Laboratory, Plymouth University. Both experiments and simulations will be informed by the analysis of field data.